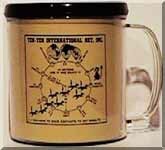 Insulated plastic coffee mugs and cold drink holders with call sign or logos make great gifts! Mugs are available with white or black inner liners. Custom designs are available with quotes on request. This is an ideal club or group item with no setup charge for most orders. All mugs are produced for "right handers" with call sign on the mug facing out when held in the right hand. 'Lefties' (or reversed design) is available on request. $9.50 includes shipping | Order Now! 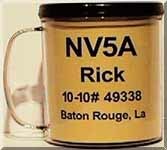 Visit our new Color Product Section to see more mugs!